I've been reading a great book recently - recommended to my by Sue Feldman with whom I work closely. 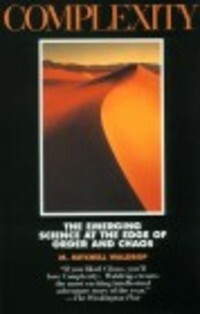 It is an absolutely fascinating book ostensibly about the founding of the Santa Fe Institute. Really however, it explains how a number of experts in fields ranging from economics to medicine to psychology to physics all came together to learn more about their own discipline by understanding the leading thinking in other disciplines. If the book was only a history of the founding of the institute it would probably be interesting but Mitchell Waldrop has a great gift for explaining this relatively complex subjects in regular English and in doing so introduces the concepts that started the field of complexity research. Fewer than two connections per element will lead a set to die; more than 12 will result in never-ending cycling. Between 2 and 12 connection per element and the set will self organize into a logical complex system. (I suggest reading the book for the exact details here). At a certain level of activity a set of elements will have a phase change. Increasing returns are a critical component of complex systems. And I haven't even finished the book. I highly recommend the read and would love to discuss it with any of you. Thanks for the pointer! There were far too many books with the title, "Complexity." The book is by Mitchell Waldrop and I've added a link to the book image.